The bonnet is released from inside the vehicle. 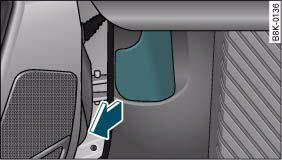 – Pull the lever under the dashboard in the direction indicated (arrow) ⇒ fig. 250. The bonnet springs out of its lock. 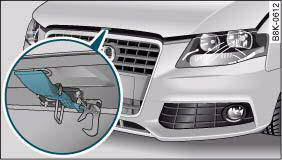 Before opening the bonnet make sure that the windscreen wiper arms are not lifted away from the glass. Otherwise the paint may get damaged. – Lift the bonnet slightly ⇒ . – Press the release catch under the bonnet upwards ⇒ fig. 251. This will release the arrester hook. The bonnet is held open by two gas-filled struts. To avoid the risk of being scalded, never open the bonnet if you see steam or coolant escaping from the engine compartment. Wait until no steam or coolant can be seen before opening the bonnet. Extra caution is necessary when working on components in the engine compartment. Always be aware of the danger of injury and scalding as well as the risk of accident or fire when working in the engine compartment (e.g. when checking and refilling fluids). Always observe the warnings listed below and follow all normal safety precautions. The engine compartment of any motor vehicle is a potentially hazardous area. ⇒ . • Switch off the engine. • Remove the ignition key. • Apply the parking brake. • Put the gear lever in neutral or selector in P.
• Wait for the engine to cool down. • Keep children away from engine compartment. • Never spill fluids on hot engine components. These fluids can cause a fire (e.g. radiator anti-freeze). • Take care not to cause short circuits in the electrical system, especially when working on the battery. • Do not touch the radiator fan when the engine is hot. The fan may start running suddenly. • Do not unscrew the cap on the expansion tank when the engine is hot. The cooling system is under pressure. • Protect face, hands and arms by covering the cap with a large, thick rag to protect against escaping coolant and steam. • If any tests have to be performed with the engine running, there is an extra safety risk from the rotating parts, such as the drive belts, alternator and radiator fan, etc., and from the highvoltage ignition system. • Vehicles with automatic gearbox: Never open the throttle inadvertently (for instance by hand from the engine compartment) if a gear is engaged while the vehicle is stationary with the engine running. The vehicle could otherwise start moving immediately and possibly cause an accident. − Always disconnect the battery. − Never work near naked flames. − Always keep an approved fire extinguisher immediately available. When topping up fluids make sure the correct fluid is put into the correct filler opening. This can otherwise cause serious malfunctions or engine damage. Inspect the ground underneath your vehicle regularly so that any leaks are detected at an early stage. If you find oil spots or other fluids, have your vehicle inspected by a qualified workshop. On right-hand drive vehicles* some of the containers / reservoirs mentioned below are located on the other side of the engine compartment. – To close the bonnet, pull it down to overcome the spring pressure. – Then let it drop into the catches; do not press down ⇒ . • For safety reasons the bonnet must always be completely closed when the vehicle is moving. After closing it always check that it is properly secured. The bonnet must be flush with the adjacent body panels. • Should you notice that the bonnet is not safely secured when the vehicle is moving, stop the vehicle immediately and close the bonnet properly, otherwise it could cause an accident.